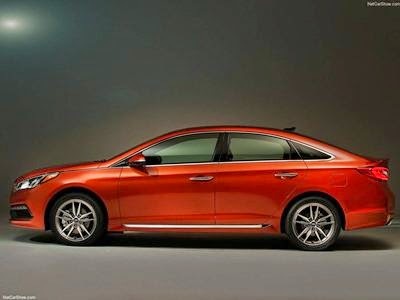 Hyundai introduced its all-new seventh-generation 2015 Sonata at the 2014 New York International Auto Show. 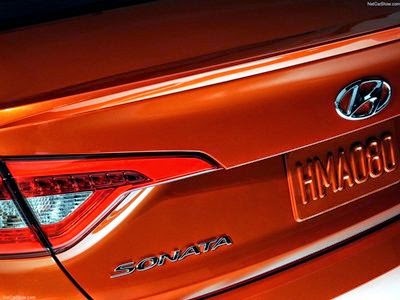 Following the incredible success of the outgoing Sonata, the all-new generation offers a more refined look through a new Fluidic Sculpture 2.0 design language, stiffer body structure, better ride quality, reduced noise, vibration and harshness and advanced safety and convenience features. Sonata truly democratizes the premium design and convenient technology of the Genesis sedan for the mid-size class. 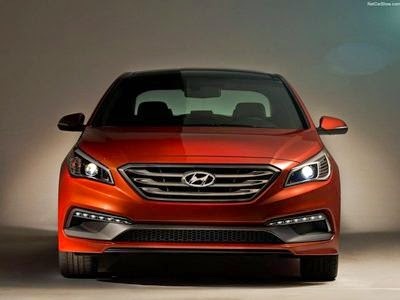 The new 2015 Hyundai Sonata will be built at the Hyundai Motor Manufacturing Alabama plant in Montgomery , Ala. and go on sale early this summer. The 2011 Sonata raised the bar for design in the mid-size sedan segment when it was introduced in 2009. Consumers noticed the groundbreaking design and so did the competition. Sonata's design matures for the 2015 model year with energetic and crisp lines complimented by smooth and subtle surfaces. Fluidic Sculpture 2.0 is a confident evolution of the original fluidic sculpture design language that perfectly expresses Sonata's premium look and excellent value. 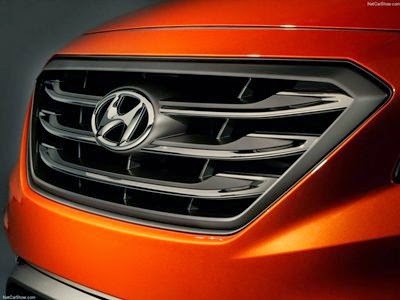 A larger, more refined grille with a wide air intake defines the face of the 2015 Sonata. Simple, harmonious lines adorn the exterior while hinting at the improved dynamic performance and human-machine connection Sonata provides. 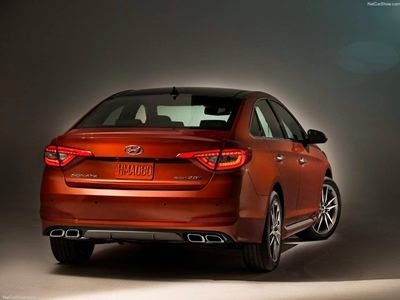 Taut, horizontal rocker panels reflect the chassis' increased stability and surefootedness while the signature Sonata beltline is now stretched tight to accentuate the sedan's strength. The coupe-like roofline remains, but it is balanced by a larger window graphic that emphasizes the roomier interior. 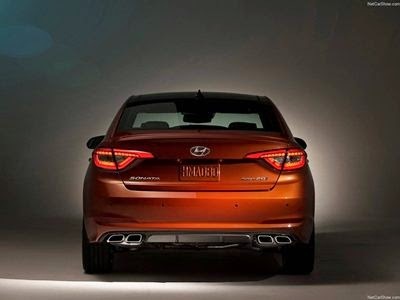 Horizontal lines in the rear underscore Sonata's width and give the car a planted look. This purposeful shape achieves a remarkable drag coefficient of just 0.27, lower than any non-hybrid in the mid-size sedan class. Shoppers looking for a traditional design will appreciate the 2015 Sonata SE's exterior styling that includes standard LED daytime running lights, 16-inch alloy wheels, a rear lip spoiler and chrome surround for the day light opening. 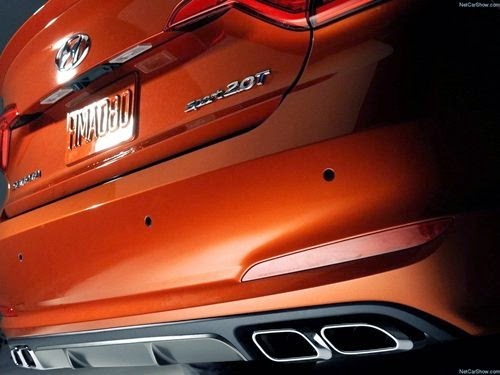 Sonata Limited adds rocker panel extensions and dual exhaust for a premium look. "We crafted the shape of the 2015 Sonata in the same way an award-winning chef refines his recipe over the years," said Chris Chapman, chief designer, Hyundai Design North America. "With the 2011 Sonata, Hyundai took the mid-size sedan from a meal to a gourmet dinner. The evolution to Fluidic Sculpture 2.0's more taut, modern lines reflect the improvements in refinement and driving dynamics for 2015." Confident, energetic lines define the 2015 Sonata's exterior and are complimented inside the cabin by a premium interior with a special emphasis on ergonomics. Intuitive buttons and controls are placed on the center stack, which is angled toward the driver to make the controls easier to reach. 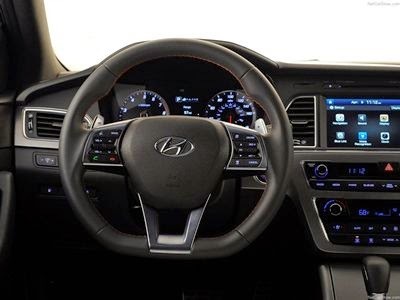 Hyundai's core interior design principles are safety, intuitiveness and simplicity and Sonata delivers in spades. Controls are grouped logically and placed in the most convenient position for the driver. To create a unified experience inside the cabin, designers met with various suppliers to make sure all buttons and switchgear have a consistent feel. The height of the display screen for the audio display or 8-inch navigation system and instrument cluster are optimized for visibility and reside on the same plane to enhance readability during a quick glance. These ergonomic enhancements help the driver remain focused on the road ahead and provide confidence behind the wheel. Sonata Sport 2.0T receives a unique interior that enhances its more dynamic personality. 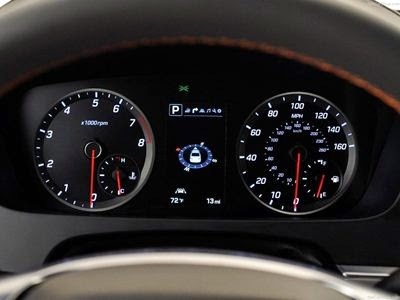 A D-cut steering wheel and paddle shifters help provide the confidence enthusiastic drivers expect while the sport instrument cluster with six o'clock needle position hints at the improved performance from the more responsive 2.0-liter turbocharged engine. Reducing undesired noise inside the cabin was a top priority for the 2015 Sonata. Engineers reduced the size of the apertures in the bulkhead and increased use of sound deadening materials in the dashboard to prevent unwanted noise from entering the cabin. Engine notes were tuned to be pleasing to the ear without being intrusive. More sound absorption materials are used under the floorpan and an underbody tray made of fibrous glass expansion board improves aerodynamics while reducing unwanted road noise. The 2015 Sonata's efficient packaging delivers outstanding passenger and interior volume. With 106.1 cu. ft. of passenger volume and a total interior volume of 122.4 cu. ft., 2015 Sonata is classified as a large car by the EPA. A rigid platform is essential for a great car. Everything from ride quality to crash test performance is enhanced with a stiffer platform. 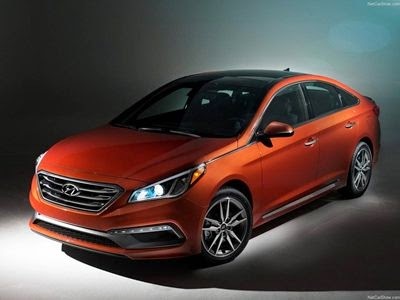 The 2015 Sonata uses advanced high-strength steel for more than 50 percent of total platform composition, which results in 41 percent stiffer torsional rigidity and 35 percent greater bending strength. Advanced high strength steel is twice as rigid as traditional steel while weighing 10 percent less. 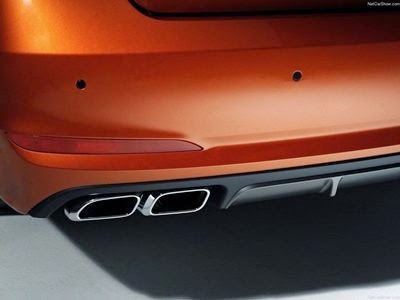 More hot-stamped components are used, especially in the B-pillar area. A revised multilink rear suspension design enhances responsiveness, handling and stability while reducing impact harshness. Dual lower suspension arms replace the old single-arm design and distribute lateral forces more effectively to improve ride quality without sacrificing handling. The new rear suspension geometry helps keep Sonata more stable under hard braking and helps provide shorter stopping distances. Reinforced side and cross members strengthen sub-frame mounting points and improve suspension responsiveness. Revised front sub-frame bushings are 17 percent stiffer than before and contribute to better steering feel and improved responsiveness. 2015 Sonata Sport 2.0T utilizes a new rack-mounted dual-pinion electric power steering system that offers more natural steering feel. Sport 2.0T models receive a unique sport-tuned suspension and larger 12.6-inch front brakes. These upgrades deliver increased driver confidence and a premium driving experience. Improvements in ride and handling were validated at Hyundai's world-class facilities in Namyang, the Mojave proving grounds in California and the new test center located at the famed Nurburgring. Validating the 2015 Sonata's performance at world-class test tracks resulted in a world-class mid-size sedan that inspires confidence in a wide variety of driving conditions. Hyundai continues its all four-cylinder engine lineup for the 2015 Sonata. A revised 2.4-liter Theta II GDI four-cylinder engine powers SE, Limited and Sport models. The 2.4-liter four-cylinder produces 185 horsepower and 178 lb. ft. of torque. Hyundai's powertrain engineers slightly reduced peak power for the 2015 Sonata to shift the powerband downward for better responsiveness in lower-RPM situations where customers spend the majority of their time. The new Electronic Intake Continuously Variable Valve Timing (E-CVVT) improves performance in low temperatures and reduces emissions. Sonata comes standard with seven airbags, including a new driver's knee airbag designed to help prevent the driver from sliding down the seat in a collision, which allows the other restraint systems to be more effective. Electronic Stability Control, Vehicle Stability Management, Traction Control, ABS and a Tire Pressure Monitoring System with individual tire pressure display are also standard. Projector headlamps are standard while HID headlamps are available. Hyundai engineers implemented many active safety technologies for the 2015 Sonata to assist drivers and help prevent accidents. No longer reserved for luxury cars, advanced safety technologies such as Forward Collision Warning, Blind Spot Detection, Rear Cross Traffic Alert and a Lane Departure Warning System are all available in this midsize sedan. 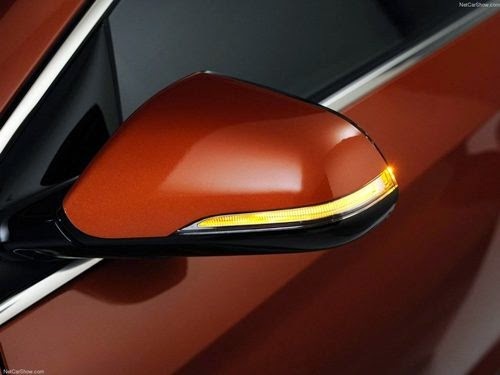 Sonata's advanced Blind Spot Detection system is designed to alert drivers of an approaching vehicle in the next lane if the turn signal is activated. This Lane Change Assist technology is a segment-exclusive active safety feature. Drivers are first alerted of a vehicle in the blind spot by warning lights in the side mirrors. When the turn signal is activated, the Lane Change Assist system determines the closing speed of any vehicle in the adjacent lane to determine if the lane change is safe. If the system determines the vehicle in the other lane is closing too quickly, it sounds an audible alarm to warn the driver that the lane change is unsafe. The Lane Departure Warning System uses a forward-facing camera to recognize lane markers. If the system detects the vehicle is headed outside the lane markers, a warning light on the dashboard illuminates and an audible sound alerts the driver. Rear Cross-traffic Alert (RCTA) is another feature derived from the 2015 Sonata's advanced Blind Spot Detection system. RCTA scans the areas to each side of the 2015 Sonata when drivers are backing out of parking spaces. If the system detects another vehicle is approaching from the side, the Sonata driver is given an audible alert. This system is another tool that helps Sonata drivers utilize the active safety technology. 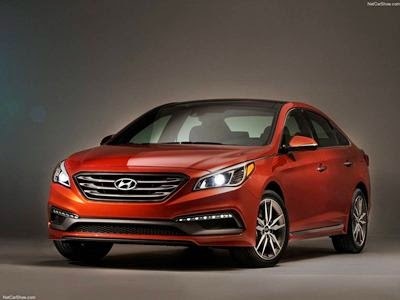 The 2015 Sonata embodies Hyundai's Modern Premium brand direction by providing convenient technology formerly reserved for luxury sedans in the mid-size segment without the premium price tag. Switching the high beams on and off manually doesn't seem like a hassle, but Sonata's High Beam Assist allows the driver to keep their eyes on the road and let the headlamps deliver maximum visibility without accidentally blinding oncoming traffic. 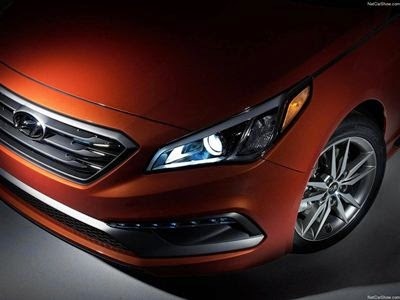 Bright LED daytime running lights give the 2015 Sonata's face a premium look. Smart Cruise Control (SCC) with full stop capability helps make driving on the freeway less stressful. This system allows full function down to zero mph to operate seamlessly using the front-grille-mounted radar sensor. SCC enables the 2015 Sonata to help maintain safer, consistent spacing with the vehicle ahead in varied traffic conditions. Smart trunk gives drivers a convenient hands-free way to open the trunk while keeping both feet firmly planted on the ground. The owner simply needs to approach the Sonata's trunk with the key fob in a purse or pocket and wait three seconds. The trunk will automatically open, making it easy to place groceries or luggage inside when hands are full. Rear seat passengers are treated to segment-exclusive sunshades, an option typically found on luxury cars. Feedback from current Sonata owners resulted in a height-adjustable passenger seat and now both front seats can be heated and ventilated. Even rear-seat passengers enjoy the luxury of heated seats on a cold day. 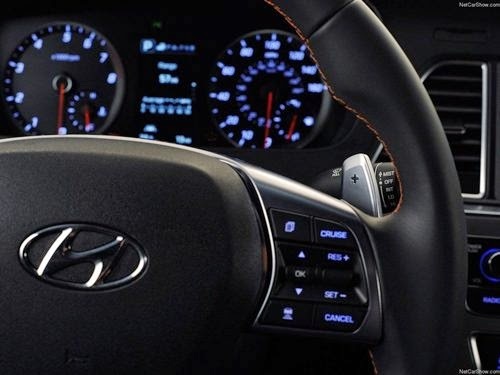 A heated steering wheel will be a favorite feature for owners of the 2015 Sonata Limited equipped with the Tech package. The desire to deliver class-above value allows these convenient technologies to trickle down from the all-new Genesis to the all-new Sonata making it the most sophisticated mid-size sedan available. 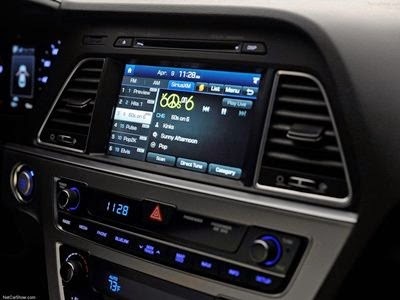 Hyundai's 8.0-inch navigation system offers an enhanced display with improved touch sensitivity, a map and music split screen display and the ability to record SiriusXM presets 1-6. Switching to a preset station in the middle of your favorite song won't be an annoyance any longer. Rewind up to 22 minutes to listen to the full song or catch up on a sports broadcast. SiriusXM Travel Link® provides access to traffic information, sports scores, weather, stock prices, fuel prices and local movie times. All 2015 Sonatas equipped with navigation will also support Pandora® and SoundHound applications as well as "Eyes Free" Siri integration, which allows drivers to perform a variety of functions without taking their eyes off the road. Apple CarPlay will take iPhone integration to the next level on the 2015 Sonata later this year.